Why choose the Adirondack Chair over other furniture designs? A truly beautiful outdoor living space is largely determined by the surrounding environment and the seating options used to enjoy it. When selecting outdoor furniture you’ll need to consider your lifestyle and how you intend to use it. It’s simply pointless selecting furniture based solely upon aesthetic appeal because you and your guests won’t use it if it’s impractical and unconformable. You’ll also need to consider how well your furniture can endure weather elements and what maintenance is required to keep it looking good all year round. In today’s market place consumers are spoiled for choice when it comes to picking outdoor furniture. In fact, so much choice can make the process confusing and tedious. 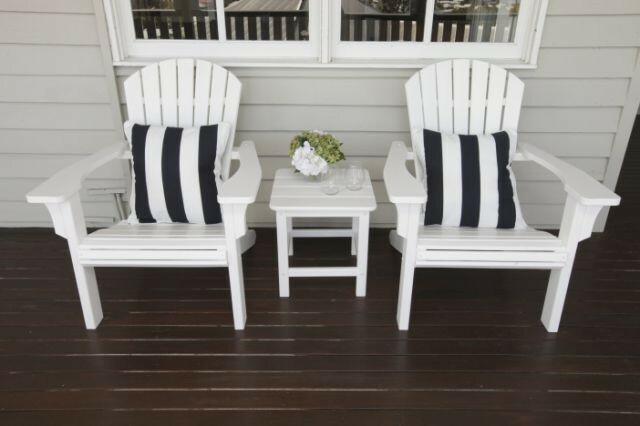 That’s where the design and style of the Adirondack chair stands out from the rest. 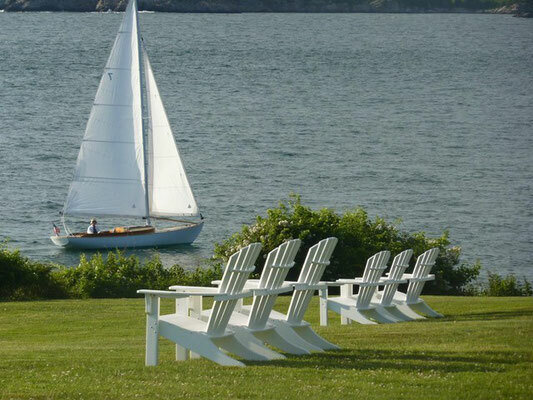 Adirondack chairs are classic, comfortable and stylish with a rich American history. A popular addition to many northern American backyards these chairs offer beauty and functionality. When furniture becomes iconic, you know there’s something truly special and unique about it. The Adirondack chair is a symbol of a certain way of life that we all aspire to and you don't have to live in the Hamptons, New York to enjoy these chairs. Its wide armrest is ideal for balancing your favourite beverage as you relax in a low slung seat. A perfectly titled back and contoured seating allows you to sit back and close your eyes or simply chat with your guests in a relaxed setting. Sloping back legs provide great stability even on sloping ground making it easy to get in and out of the chair. 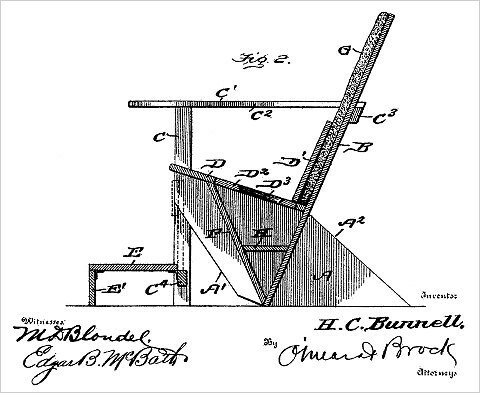 Why else would Thomas Lee creator of the original Adirondack chair in 1903, go to the trouble of designing his own outdoor chair when there were so many beautiful designs available in the late Victorian era? The answer is simple; Lee wanted a chair that was more durable, comfortable and sturdy. The modern Adirondack chair has undergone some modifications while staying true to Lee’s original design. One of the biggest design improvements today is the use of materials such as polyethylene and stainless steel. This type of lumber is made using recycled plastic delivering a wood like finish that is entirely maintenance free. 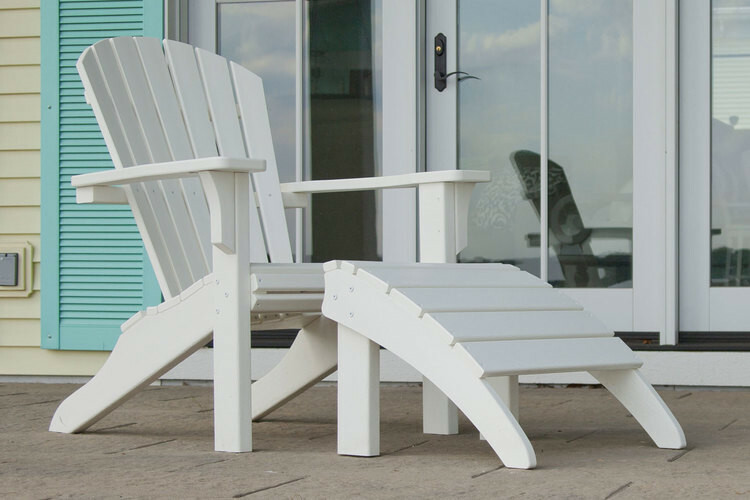 The Seashell Adirondack chair is made of this material, making it the ultimate eco friendly outdoor leisure chair ideally suited for the outdoors all year round. This means that the chair will not rust, chip, split, splinter, crack fade or grow mold. It will never need sanding, sealing or painting unlike wood and other similar products. Adding the Seashell Adirondack product range to your outdoor area means that you won’t have to ignore it in the colder months. Unlike furniture made of aluminium, rattan and wicker it doesn’t need special care or covering up when the weather turns nasty. With all these features and benefits why would you consider anything else? 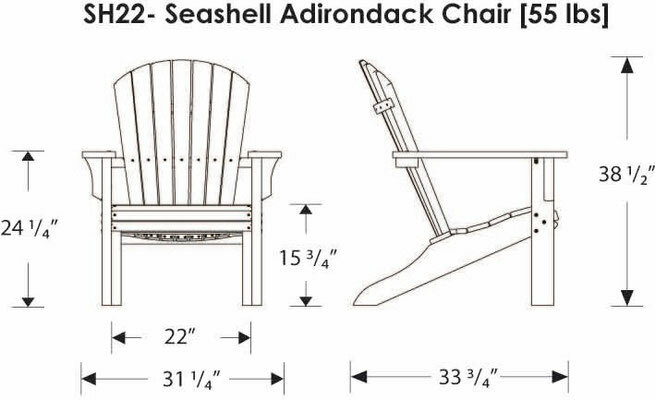 The Seashell Adirondack chair and accessories are made in America and are proudly brought to you by Meadow Lane Home Decor. We invite you to browse through our online store for any additional information and guidance on how to make your purchase.